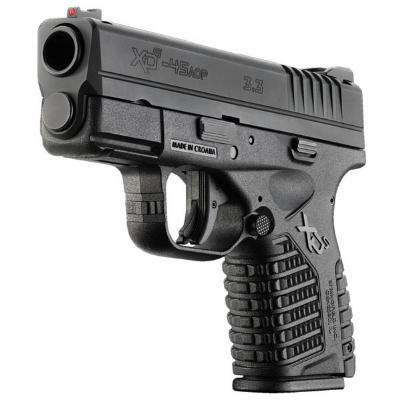 SPRINGFIELD ARMORY® XD-S™ SERIES – BLACK•SA •Features slimmer, single-stack black polymer frame for maximum concealability •Forged steel slide •Fully supported ramp barrel w/Melonite® finish •Single-position Picatinny rail accommodates lights & lasers •Snag-free low-profile sights (holster friendly) •Two interchangeable backstraps for grip customization •Modified contour of grip allows any hand size to release mag without twisting or moving firing grasp •Sure grasp slide serrations •USA (Ultra Safety Assurance) Trigger System™ •Loaded chamber indicator •Grip safety •Enhanced secure grip texture •Dovetail rear (steel) & fiber optic front sights •Fail-safe disassembly •Includes (2) stainless steel mags •OAL: 6.3” •Ht. : 4″, 4.4″ (w/mag) •Width: 1″ •Slide Width: 0.9″ •Wt. : 29 oz.CaI. Cap. Brl. .45 ACP 5+1 3.3” Just a short drive from Charlotte NC to Mooresville.